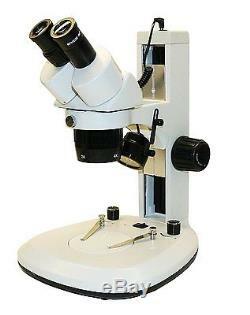 Walter Products QFN-24-L Binocular Stereo Microscope, WF10x Eyepieces, 10x/20x. The Walter Products QFN-24 Binocular Stereo Microscope has a pair of 10x widefield high-eyepoint eyepieces, 1x and 2x objectives for 10x and 20x magnification, selectable upper and lower LED illumination, interchangeable stage plates, coaxial focus, and a fixed stage with clips. The binocular viewing head has a pair of eyepieces with interpupillary adjustment and fixed inclination to reduce eye and neck strain. High-eyepoint eyepieces ease viewing for viewers wearing glasses. Dioptric adjustment accommodates individual eye-strength differences. A stereo microscope, sometimes called an inspection or dissection microscope, has a longer working distance that enables users to manipulate the object being inspected, and is used in semiconductor and electronics industries or by mineralogists, dentists, and students when the user needs to handle or perform work under magnification, including circuit boards, rocks and gems, and dental appliances. The microscope has upper (episcopic) illumination that reflects light off the specimen for enhanced visibility of opaque specimens and lower (diascopic) illumination that transmits light up through the specimen for enhanced visibility of translucent and transparent objects. The LED light sources provide bright, cool light for working with temperature-sensitive or live specimens, and a rheostat controls the amount of light emanating from each lamp. Lighting can be configured for upper, lower, or simultaneous upper and lower illumination. The reversible black and white stage plate is used with top-mounted lighting to provide contrast with light- and dark-colored specimens. The glass stage plate allows light to pass through from below. The fixed stage has stage clips to secure the slide or specimen in place while viewing. Coaxial focus eases focusing for left- and right-handed viewers. Focus tension control prevents stage drift, and a built-in slip clutch system prevents damage to the focus mechanism. Upper and lower LED with rheostat. Microscopes are instruments used to enhance the resolution of an object or image. Types include compound, stereo, or digital. Compound microscopes use a compound optical system with an objective lens and an eyepiece. Stereo microscopes show object depth in a three-dimensional image. Digital microscopes are used to display an image on a monitor, rather than looking through a lens. Microscopes can have monocular (one), binocular (two), or trinocular (three) eyepieces, with varying magnification abilities. Magnification ability refers to the size of an image. Resolution, also known as resolvant power, refers to the clarity of the image. The interaction between field of view (FOV), numerical aperture (NA), and working distance (WD) determines resolution. Microscopes can control magnification through a fixed focus, or through a range of adjustments. They can also utilize LED, fluorescent, and mirror light sources to help control viewing capabilities. Walter Products QFN-24 Binocular Stereo Microscope. Reversible black/white stage plate, 95mm. We do not accept P. BOXES - PLEASE PROVIDE A PHYSICAL ADDRESS. The item "Walter Products QFN-24-L Binocular Stereo Microscope, WF10x Eyepieces, 10x/20x" is in sale since Friday, March 31, 2017. This item is in the category "Business & Industrial\Healthcare, Lab & Life Science\Lab Equipment\Microscopes". The seller is "rockymountainwholesale" and is located in US. This item can be shipped to United States, to Canada, to United Kingdom, DK, RO, SK, BG, CZ, FI, HU, LV, LT, MT, EE, to Australia, GR, PT, CY, SI, to Japan, to China, SE, KR, ID, to Taiwan, ZA, TH, to Belgium, to France, to Hong Kong, to Ireland, to Netherlands, PL, to Spain, to Italy, to Germany, to Austria, IL, to New Zealand, PH, SG, to Switzerland, NO, SA, UA, AE, QA, KW, BH, HR, MY, CL, CO, CR, PA, TT, GT, HN, JM.